Last December, a woman I was dating told me she believed in ghosts. We were chatting at a holiday party with two other guests, one of whom manages communications at the Lobero, the oldest theater in California. The place has an amazing history, the communications director, Angie, said. Oh, and it’s haunted. The four of us were drinking cocktails amid the bustle of a downtown Santa Barbara restaurant. Yet we still leaned in over our table’s fading candle and lowered our voices, as if to nestle closer to the campfire. The Lobero is home to two ghosts, Angie explained: Harry Pideola and Dr. Frank Fowler. Harry was the theater’s Prohibition-era night watchman. He lived upstairs in an old converted dressing room, where he also died. Dr. Frank was a founder of a local theater group. Both ghosts were known to cause mischief around the place, Harry with a taste for pranks, Dr. Frank with a habit of popping up in a top hat and tuxedo. Angie hadn’t seen the ghosts, but she insisted other people had. The theater’s director had a few chilling tales of his own unusual encounters. And had we read the story by the Santa Barbara Sentinel reporter? He’d planned on spending a night in the theater to debunk the myth last Halloween, but fled after a push-broom showed up where one hadn’t been and the specter of a man in tails flashed before his eyes. This was all fantastic material, I thought, for a person who gets paid to promote the theater. After Angie leaned back to let us ponder the mystery of what she had just revealed, I couldn’t help taking a dig at the story by asking if any of the theater’s visitors ever were gullible enough to believe it. I looked across the table at my date, expecting some sort of grin. Instead, she looked disapproving. “You don’t believe in ghosts?” she asked. The fourth person in the group chimed in and agreed he’d seen some spooky things. Then they all started talking about what they were cooking for Christmas dinner. A year later, that conversation still bugs me. Yes, there are countless things about this world I don’t know, but no, I don’t believe in ghosts. And if I did, I wouldn’t be so casual about it. As the group went on, the skeptic in my head climbed on his high horse and rode through a whole thorny meadow of implications that follow from a belief in the phantasmic. Ghosts mean there’s an afterlife. An afterlife suggests we have souls. Souls suggest there’s a god. Shouldn’t believing in even the possibility of ghosts drastically shape our belief about pretty much everything—how we should live our lives, what we’re doing here in the first place? If I step off that high horse, though, I get it. 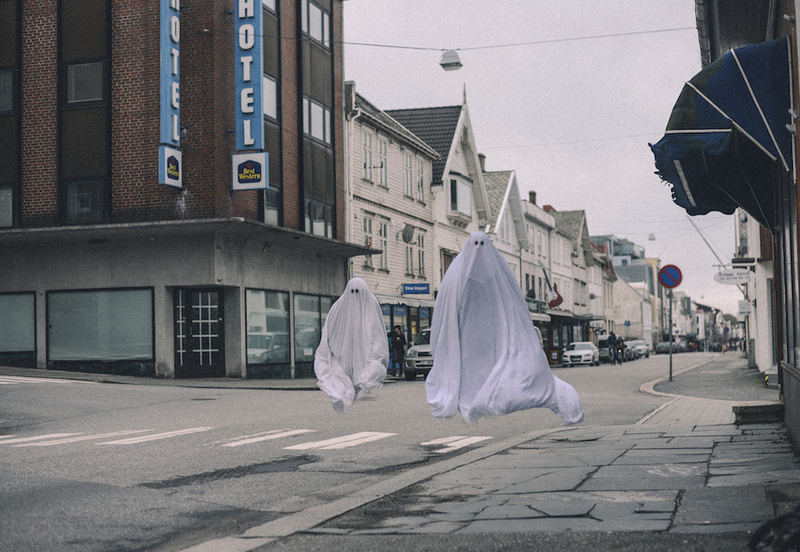 Ghosts are fun. We love ghost movies, Halloween, that TV show Ghost Hunters. If someone gets a kick out of a ghost story, it’s not that different from getting a kick out of a vampire story, or a zombie story, or an apocalyptic tale. And ghosts do offer hope—that the people we love are never really gone, that there is indeed something waiting for us on the other side. Even a casual belief can provide a creepy sort of comfort. Still, there’s something deeper about ghosts that nags at me. It’s not what their existence implies, but the fact that I’d have to deal with them if I believed in them. My life, like everyone’s, is already filled with things that keep me up at night. I have deadlines to meet, people to please, student loans to pay. And then there are the big questions: Will the work I do ever live up to my ambitions? Am I a good person? Would life be different if I’d tried harder when I was younger? Would it be better if I’d tried less? In Tribute to Freud, a 1956 memoir by the poet H.D. about her friendship with the famed psychoanalyst, there’s a line that has stuck with me for years. “We are all haunted houses,” H.D. writes, reflecting on the experience of living through World War I. Her point is that everyone’s haunted by something—traumas, lost friends, lovers, expectations, mistakes, failures. With so much that bedevils us, what good are ghosts? I don’t believe in them because I don’t want to believe in them. The things that haunt me are enough, and they don’t live in someone else’s theater. Paul Bisceglio is an associate editor at Zócalo Public Square. Primary editor: Sarah Rothbard. Secondary editor: Siobhan Phillips. *Photo courtesy of Anne Marthe Widvey.